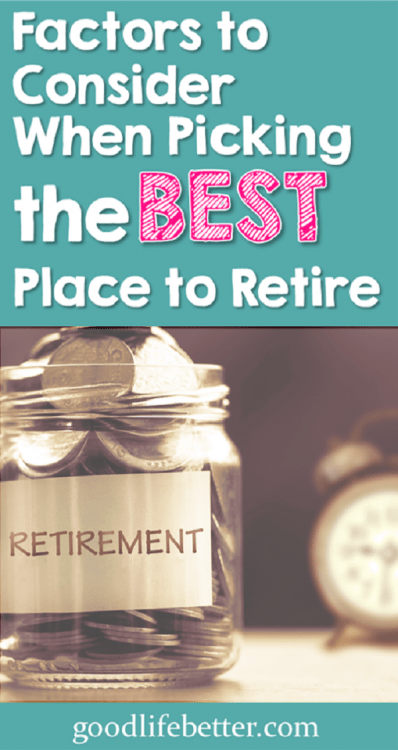 Factors to Consider In Picking The Best Place to Retire | Good Life. Better. I spend way too much time thinking about where I am going to live when I retire, especially given that it will likely be another decade before I stop working full time. The thing is, where I retire will affect how much I enjoy my retirement (and I really want to enjoy my retirement!). My current obsession is identifying the factors I should consider when evaluating if a particular location is the best location for me. 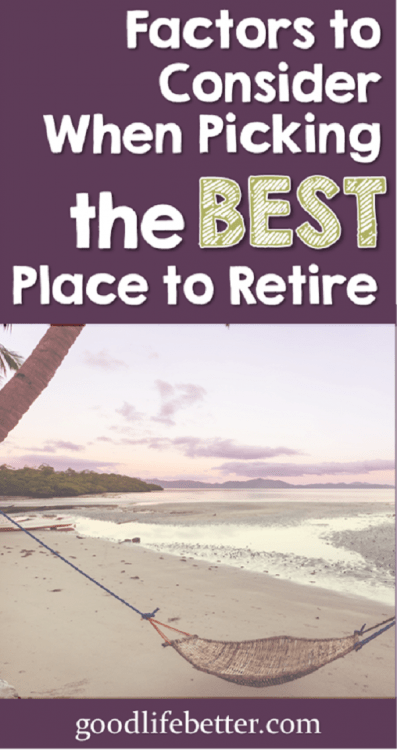 Several websites put out annual lists of the best places to retire (for example, AARP, U.S. News and World Report, and Forbes). I like reading these but consider them a starting point only because, given some of the cities ranking high on these list, it’s pretty clear I value different things. So far, here are the factors I keep coming back to. The most obvious question is should I move at all. If I like where I am living at the time, have a lot of friends to hang out with, and connections to local institutions, staying put may be the best option. Unfortunately, that isn’t the end of it. Even if I do stay in the same general area, I think it unlikely I will stay in the same exact spot. During my working years, my commute will be a big factor in determining where I want to live. Making sacrifices when it comes to space and location will be rewarded with less time in the car or on the train. But once I retire? Rush hour becomes a thing of the past and I will be able to shop around for accommodations that fit my new life. If I do end up moving somewhere else, here is what I think will matter most in deciding where to live. As you can see, I have given myself a lot to think about. I want to live no more than six hours drive or a short flight from my family. Why not closer? They still live in the state I grew up in and I am about as likely to sprout wings and fly as I am to move back there. In planning for retirement, I am budgeting a lot for travel. There is so much of the world I have yet to see and many places I have visited that I would like to return to. Ideally, I will live close to an airport with a lot of options for direct flights. This becomes even more relevant as airlines reduce the number of flights to smaller airports. I have lived in a city where the majority of flights seemed to leave before 7 am and return after 9 pm. It’s not fun. College towns pop up a lot on lists of the best places to retire because they offer so many opportunities for staying engaged mentally. This is important to me but I don’t want to rule out non-college towns thinking I will be bored to tears. Besides, given all the travel I am planning, it may be nice to come home to a town that offers more in the way of hiking and biking trails than museums. There is no getting around it: the healthcare system is the U.S. is not working well right now. While it goes without saying that planning for the costs of insurance and care is an enormous challenge, don’t ignore the fact that accessing that care can also be difficult. Rural and even suburban hospitals are struggling to remain competitive and attract top specialists. Because driving for hours to see a doctor does not appeal to me, access to good healthcare stays on the list. I probably should have listed this higher up—possibly even above proximity to family—but I didn’t want to seem too wimpy. The truth is that I don’t want to live somewhere with long, cold, and snowy winters. It doesn’t have to be Florida but it also can’t be Buffalo (I visited Buffalo in the summer and it was lovely but do you know some winters they ship snow out using trains because they run out of space to shovel it?!). This last category—community—is a bit hard to describe. I think it is a remnant of watching every episode of Northern Exposure at least a dozen times when I was younger (okay, maybe just the first 4 seasons). It doesn’t mean I have to love my neighbor, but it would be nice if there existed a camaraderie within the community that we were working toward a common good. I currently live in a small town within a large city and I like it. Sure, my taxes are a little higher but we have our own (much more responsive) police force and tons of community events and classes open only to residents (I took a great 6-week introduction to tennis class for $75!). I should add that where I currently live is a really old town that the bigger city grew around, and not a planned development. Something like that may be okay but I am a bit suspicious of them. I don’t want to move some place expecting Cicely, Alaska, and end up with the senior citizen version of Melrose Place. Ultimately, housing costs may be the biggest factor, both if I stay put or move. Right now, a large portion of my income goes toward this category and that won’t change when I retire. Currently, my savings goals assume I will need to budget for either rent or a house payment. As I get closer to retirement and the need to narrow down exactly how much I will need to live off of grows, I will likely start doing some price comparisons and neighborhood shopping. While I may not own something during my remaining decade of work, it might make sense to purchase something close to retirement. This will allow me to project my housing costs with a lot more certainty, including estimated renovation and repair costs. What Factors Matter Most to You? 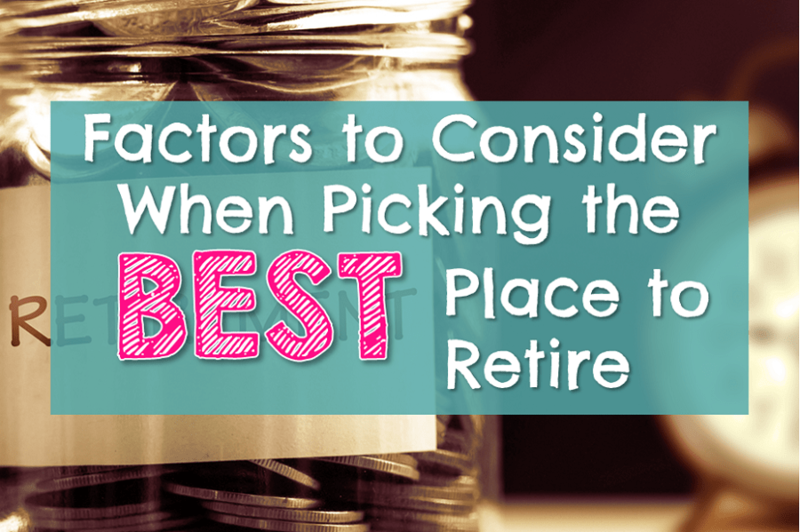 Have you spent time thinking about where you want to live in retirement? What factors matter most to you? Let me know in the comment section below! I grew up in a college town, and I always want to live in a college town. I think universities encourage diversity and provide area residents with lots of affordable and high quality entertainment. And living near a decent airport would be nice. I’m a little over an hour from a good airport currently and that brings some annoyances with travel. There is something nice about college towns! But man, I am not a morning person and the flights hardly ever left after 7 am. Plus, since I mmoved, Delta has cut back services to that town. Can’t imagine the schedules now! It sounds like (other than the housing costs and proximity to an airport hub) your current location could be in the running. Are those two things enough to make you not consider just staying put? Possibly–how much I am able to save will matter a ton. Staying where I am has such a high cost of living that moving to a smaller town might still be preferable. On the ChooseFI podcast, they talked about how even just living in Richmond (not a small town but smaller than where I currently live) has made a huge difference in what they are able to accomplish. I will have a great savings rate when I finish paying off my debt May 4th but I am old enough to know that things could change. I’ve lived in the same state (though, different cities) my whole life. I’m ready for a change. My thought is that wherever I move to next will be temporary – unless I really enjoy it. You mention airport proximity. That’s one of my musts. Probably on the west side of the States where the landscape is vastly different from where I am now. Also, being an hour or less plane ride away from my favorite cities would be a plus. I like the idea of a change of scenery! My family is on the east coast so will likely stay on that side of the country but that still leaves a lot of options. Thanks for the comment! I’d like to retire to a place that is inexpensive, beautiful, quiet, uncrowded and has great skiing /hiking/biking. Basically, I’m looking for the opposite of NYC where I currently work. Haha—I think it makes sense to seek out something new. Especially a place that allows you to do all the thing you love to do now but can’t do locally. Travel is such a big one for me which is why I prioritize the airport. Thanks for the comment! Weather will probably be one of our most important factors. We live in the Chicago area and as I get a little older, winter season seemed to be getting longer and longer. This year, it was already mid-April, and we still had snow days. No judgment here for prioritizing weather–the last thing you want in retirement is to feel stuck indoors because its either too cold or too hot outside. I have always lived in the South so cold weather is not in my future in retirement! Thanks for stopping by!